Come celebrate with other parents, teachers, librarians, authors, illustrators, publishers, students and researchers who share an interest in diverse children's books. Hear about the collection, peruse the books and learn how you can check them out for personal or professional use. 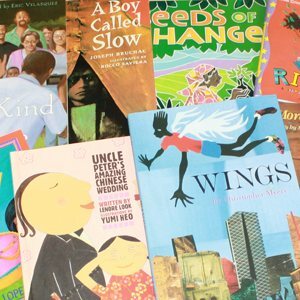 Founded by Krista Aronson, Associate Professor of Psychology at Bates, in collaboration with Anne Sibley O'Brien, children's book creator, the collection is comprised of fiction and narrative non-fiction picture books (grades K-3) depicting characters of color published in the United States between 2002-2013. Using the collection Professor Aronson, her collaborators and students contribute to the national dialogue about diverse children's books, capturing and communicating their dominant themes and exploring their impact on inclusion and bias, including how teachers and parents utilize them in everyday life. In line with its community focus, these books are available to everyone at Bates and beyond for research, education and personal use.